Last year, China imported 150/690=22% of all seaborne steam coal traded worldwide in 2010, and projections are that China will try to import more this year. China also has firm plans of of limiting energy use and shutting down 2,000 coal-intensive industrial facilities. In short, it seems that China's coal production has peaked. 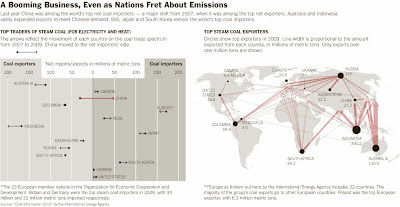 China produces roughly 1/2 of world's coal. The Oildrum article does not seem to address the ever-increasing mine depths that will ultimately curtail and stop coal production from these mines. Mozambique is going to become the second biggest exporter of metallurgical coal, which is not the same as the second largest coal exporter. Best of all, we have an economist's argument; many steam coal markets (Illinois Basin, Uinta Basin and Australia Newcastle) are up 50% over January 2008. Appalachian markets, which are a mix of steam and metallurgical coal, are up about 20%. Oil first hit $100 in January 2008, so oil is slightly down over the same time period. The coal price increase shows up nicely on the EIA graph, but is dwarfed by the mid-2008 price spike. 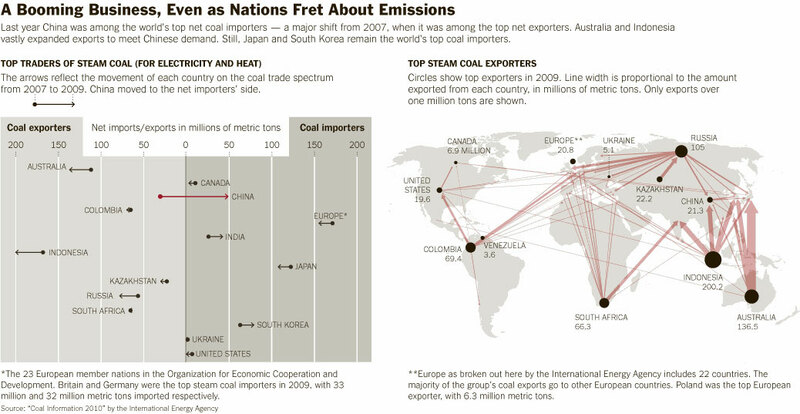 These facts do not point to coal as an abundant commodity that everyone wants to phase out. As a reminder, the Hubbert (Gaussian) peaks of production rate emerge not because we are running out of a resource, but because the physical availability of the resource continues to decline. Economists have a difficult time dealing with geology and geophysics of a finite spherical Earth, when their preferred model is a flat and infinite planar Earth from which resources can be drawn at will if the price is right.